The Buckeyes pull away in the second half for an 83-70 victory. COLUMBUS, Ohio — Stephanie Mavunga had 26 points and 16 rebounds Sunday to lead eighth-ranked Ohio State to an 83-70 victory against Maine in a nonconference women’s basketball game at Value City Arena. Julie Brosseau scored a career-high 29 points and tied the single-game school record for 3-pointers made in a game with seven for the Black Bears (4-4). Mavunga shot 11 of 12 from the field. Sierra Calhoun added 16 points for the Buckeyes. Maine hung around early but was held scoreless over a 7:14 span as the Buckeyes used an 8-0 run to take an 18-8 lead. Ohio State led 35-24 at halftime and by as many as 20 points with less than four minutes remaining. 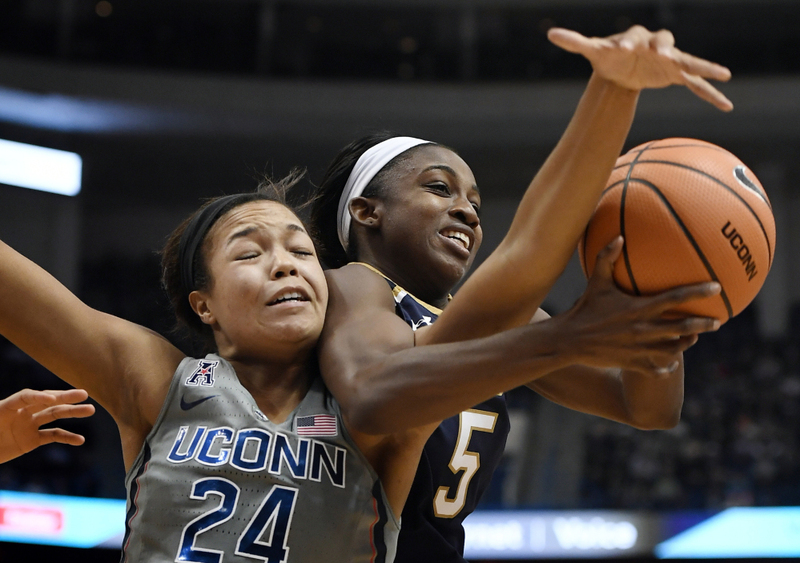 (1) CONNECTICUT 80, (3) NOTRE DAME 71: Katie Lou Samuelson scored 18 points, Azura Stevens added 17 and UConn (7-0) rallied from an 11-point fourth-quarter deficit to beat Notre Dame (7-1) at Hartford, Connecticut. (2) TEXAS 81, GEORGIA 53: Ariel Atkins had 17 points and nine rebounds, Jatarie White added 13 points and Texas (7-0) cruised over Georgia (7-1) at Athens, Georgia. (4) LOUISVILLE 68, SOUTH DAKOTA STATE 64: Asia Durr scored 18 of her 20 points in the second half and Louisville (8-0) overcame an eight-point halftime deficit to beat South Dakota State (6-2) at Brookings, South Dakota. (5) SOUTH CAROLINA 72, (14) DUKE 52: Alexis Jennings had 21 points and 10 rebounds to lead South Carolina (8-1) over Duke (6-2) at Columbia, South Carolina. (6) MISSISSIPPI STATE 79, OKLAHOMA STATE 76: Victoria Vivians scored a season-high 30 points and had eight rebounds to help Mississippi State (8-0) beat Oklahoma State (6-2) at Starkville, Mississippi. (7) UCLA 74, UC SANTA BARBARA 44: Monique Billings had 17 points and 10 rebounds, and Jordin Canada added 14 points to lead UCLA (7-1) over UC Santa Barbara (1-7) at Los Angeles. (9) BAYLOR 81, (16) STANFORD 57: Kalani Brown had 28 points for Baylor (7-1), which scored the first nine points and led throughout to beat Stanford (5-4) at Waco, Texas. 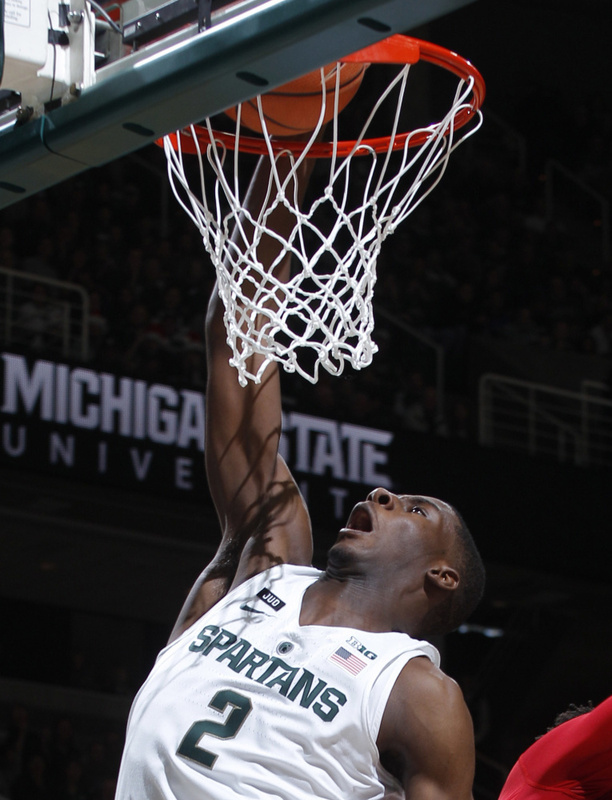 (3) MICHIGAN STATE 86, NEBRASKA 57: Nick Ward matched his season high with 22 points as part of a balanced offense that helped Michigan State (7-1)beat Nebraska (6-3) in a Big Ten opener at East Lansing, Michigan. (5) NOTRE DAME 71, ST. FRANCIS (N.Y.) 53: Martinas Geben had 14 points and 10 rebounds to help Notre Dame (7-1) beat St. Francis (2-6) at South Bend, Indiana. (12) MINNESOTA 89, RUTGERS 67: Nate Mason scored a season-high 26 points, Jordan Murphy had his ninth straight double-double to start the season and Minnesota (8-1) beat Rutgers (6-2) at Minneapolis in a Big Ten opener. (13) NORTH CAROLINA 97, TULANE 73: Luke Maye had 22 points and 10 rebounds as North Carolina (8-1) routed Tulane (6-2) at Chapel Hill, North Carolina. SETON HALL 79, (17) LOUISVILLE 77: Desi Rodriguez had a season-high 29 points, including an off-balance bank shot with eight seconds remaining, to rally visiting Seton Hall (7-1) to an upset victory over Louisville (4-2). CENTRAL FLORIDA 65, (24) ALABAMA 62: A.J. Davis made the go-ahead free throw with 25 seconds remaining, then Terrell Allen stole the following possession and fired to teammate Dayon Griffin for an easy layup that sealed an upset for Central Florida (5-3) over Alabama (6-2) at Tuscaloosa, Alabama. VERMONT 2, MAINE 2: Brooke Stacey scored the tying goal 15:49 into the third period from Tereza Vanisova and Daria Tereshkina as the Black Bears (11-6-3, 5-3-2 America East) tied the Catamounts (5-11-3, 3-7-2) at Orono. After Kourtney Menches gave Vermont the lead, Vanisova tied it in the first period. Taylor Willard of Vermont made it 2-1 in the third before Stacey tied it again.